At the time of writing, I've got almost 600 followers on Twitter. This is the place that I always update first with Run Geordie Run news and photos. A recent example of this was when I fell of my bike last week and I wrote the following on Twitter "Doh! Flat tyre! Crashed on a corner! Think my ankle is broken. Not good! At least the sun is out.". Twitter has added a valuable extra dimension for Run Geordie Run. I've made contact with some great people. The support and encouragement I get from the good folk on Twitter will be a very valuable asset over the coming months, I'm sure. 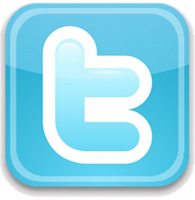 If you would like to follow me on Twitter, then please click here. No running (obviously) but still a busy week! I was discharged from hospital on Wednesday afternoon. Since then, I've been spending my time catching up with all of the admin, PR and planning associated with Run Geordie Run. The first task was to give an interview to The Journal which was also picked up by The Evening Chronicle on Thursday. Ever since I started training for USA 2011, the Journal have been very good to me and this is the second time I've featured on the front page. I pity the poor readers that were eating their breakfast over this particular edition! The Journal's headline on page 9 was "Unlucky break is a setback for epic run". The sub headline read "But dream of charity trek is not scuppered". I must admit, that's exactly how I felt when I lay on the floor just after I fell off my bike a week ago. It's also exactly how I feel writing this blog post right now. I'm still coming to terms with the fact that I've undergone an operation to have two pins inserted into my ankle. Without so much money for the 2 charities riding on a successful 3100 mile run next year, there's no way on earth I would have entertained having an operation. I would have let nature take it's course with the risk of the ankle not healing properly. Having that operation was a massive, massive decision for a big wimp such as me. If anyone ever doubted my commitment to raising funds for St Benedict's Hospice and The Children's Foundation then surely they must doubt no more. Thanks once again to The Journal for some first class coverage. You can read the article here. Also, thanks to Dave Fairlamb (pictured left) for his phone call at 07:30 on Thursday morning! "You're in the Journal, you're in the Journal" he said as I was trying to enjoy my first lie in of 2010! The next bit of PR was to give an interview to long running Newcastle United fanzine, The Mag. I've got every issue ever published since da1 one. Appearing in the Summer Special edition is going to be an absolute thrill for me as well as a good opportunity to spread the word about Run Geordie Run. It's out on the 4th of June. The Mag is available from many good newsagents in the North East. I managed to read an interview that I gave a few weeks ago to a trainee journalist, Chris Conway, at The University of Sheffield. There is some audio in there too. It can be read and heard here. I've been talking to Shelli Mayfield over the last few days. Shelli is the very kind lady who is looking after all of the Run Geordie Run PR in the USA. Shelli issued a press release this week to various organisations and is currently working on a more detailed press pack. The press release appeared on runningnetwork.com soon after it's release. As a result of that, it wasn't long before CBS Radio in Detriot were in touch asking if it would be possible to do an interview during the actual run next year. The running network article can be viewed here. I've also spent the last few days answering a lot of outstanding emails and continuing the exercise of plotting the route across the USA. You can view the route maps here. All in all it's been a busy few days. I've been quite overwhelmed this week with all of the texts, emails, phone calls, Twitter and Facebook messages of support. My mentors David Fairlamb and Mark Fleming have been in constant contact and I've had the usual funny quips from my cycling buddies, The Men Of Steel (aka Steve Harrison, Ben Lavan, Martin Ibbotson and Mark Fleming). Keep the message coming folks. They really do brighten my day and will be a massive help as I return to fitness over the coming months. 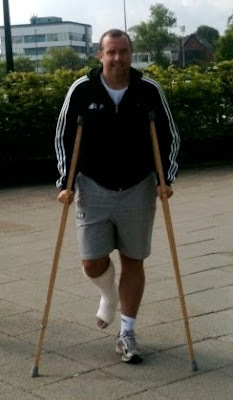 Seeing Danny Simpson on crutches yesterday on nufc.com after an ankle operation gave me a little more confidence prior to my operation. It made my day when I saw the articles on nufc.com today with the pair of us on crutches. I suggest you head over to www.nufc.com to read all about it. I'm writing this blog post from the comfort of a hospital bed, having broken my ankle on Sunday. I had an accident on the C2C as my front tyre punctured on a corner and I was left with little control. Thankfully the Men of Steel and Mrs Run Geordie Run's swift action saw me in hospital soon after the incident. I had 2 pins inserted in my ankle during an operation yesterday. The operation went well and I'm close to returning home to begin my rehabilitation. I was initially very scared about having the operation. If I didn't have the run across the USA to complete next year I would not have taken the decision to have the operation. Being the wimp that I am, it was a big step to take. Very big! I've got to say that the staff here at Newcastle General have been great. I feel like I'm having a bit of a holiday actually. I've been in constant contact with David Fairlamb who has spent 9 months of his life in plaster at various times. My trainer, Mark Fleming, has also been in touch as well as the other Men Of Steel. Mrs Run Geordie Run (my wife Katy) and Run Geordie Run junior (my son Jack) have been a tremendous pillar of strength. Add to all that the messages by text, Twitter and Facebook and it's easy to see what an amazing support network I have. I'm so lucky! There are so many people in this hospital far worse off than I am. This helps get things into perspective. I'm following the advice of David Fairlamb and Mark Beaumont who say that I must keep my focus. That focus is set firmly on running across the USA in 2011 as planned. 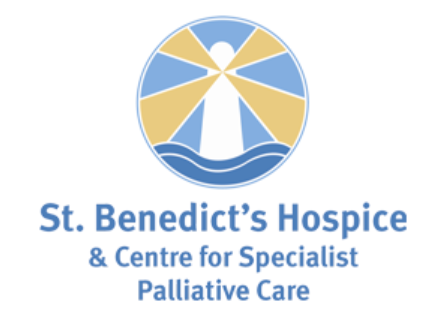 The charity fund for St. Benedict's Hospice and The Children's Foundation currently stands at £10,523.20. The potential to raise at least 5 times that amount for 2 fantastic charities is very much there. Together; me putting one foot in front of the other and you, the generous public, friends and colleagues, we can make a real difference to the lives of children and adults alike in our region. I've seen for myself the good work that the 2 charities do. That's how I know what a difference charitable donations from the genetal public makes. It would be great if you could also join the growing army of followers on Twitter. My ID is @rungeordierun. 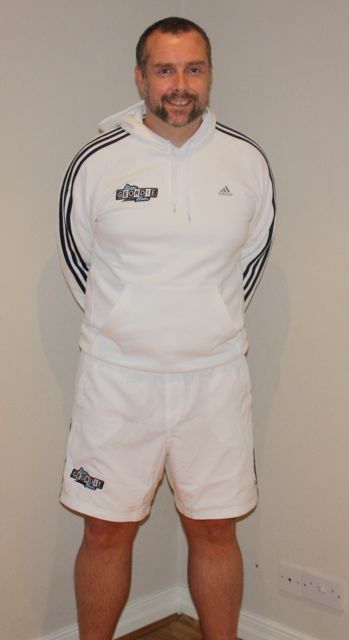 A few weeks ago I took delivery of kit from my kit sponsor Adidas. I took that kit down to local firm, customplanet.co.uk this week, for them to embroider the Run Geordie Run logo on. 2 days later and customplanet.co.uk had applied the logo to 30 or so pieces of kit. I'm really pleased with the results. That's me on the left "modelling" (and I use that word loosely!) some shorts and a hoody. I've also got tracksuits, technical t-shirts, polo shirts and some casual t-shirts and shorts in the collection. As they did with the production of the Run Geordie Run t-shirts, customplanet.co.uk have done a cracking job. They are a local firm based at Camperdown Industiral Estate just north of Gosforth. I wouldn't hesitate to recommend them for t-shirt printing and now logo embroidery. I'm now looking for companies who would like to have their logo added to my kit. This kit will be worn in all future public events and media appearances. The next one being the treadmill event at the Hilton in Gateshead. I've also got some up and coming items to appear in the Evening Chronicle. Most importantly of all, though, the kit will be worn and will be highly visible throughout the run across the USA. Given both the current and projected level of interest in the 3100 mile run, I'm confident that I can attract the right kind of companies to sponsor my kit and make a good contribution to the 2 charities. 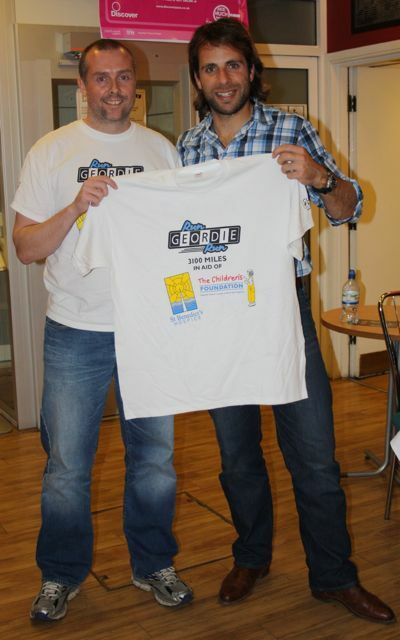 If you are interested in sponsoring my kit then please drop me a line at sponsorship@rungeordierun.com. The painstaking process of planning the route and checking the mileage continues on a daily basis here at Run Geordie Run HQ. This is my 3rd attempt at planning the route across the USA and I'm starting to get a very good appreciation of the miles and miles of road that I'll be running on next year. I've had to do a bit of re-planning today due to the Zion - Mt. 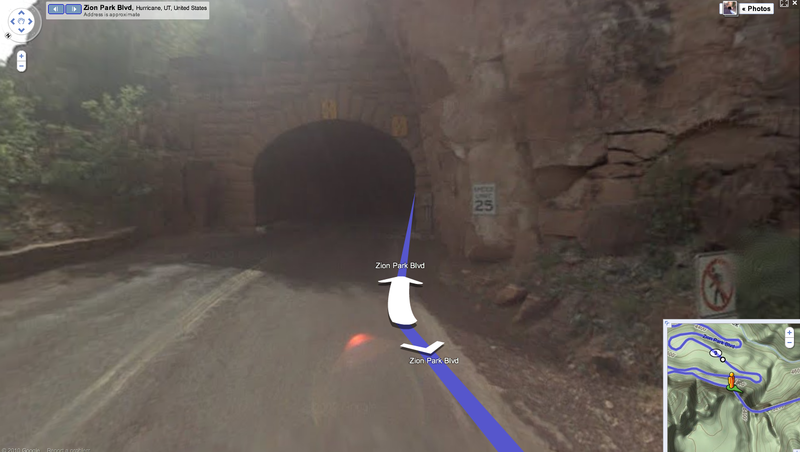 Carmel Tunnel in the Zion National Park, Utah (Pictured). I was due to be running through this area on day 18. You can see the NO PEDESTRIAN sign if you look closely. I walked through the tunnel using Google Street View. It's very dark and dangerous! There's some kind of Ranger on the other side of the tunnel. Even if I did risk going this way I'd probably get into trouble. The alternative seems to be running an additional 33 miles to the south and meeting back up with the road again further on. Doh! There are a few savings to be had later on so I'm not too worried about the additional mileage just yet. Unlike the previous 2 planning attempts, I've got an eye on where I can best include the rest days and where the most likely pick up/drop off points are for the Support Team. The first rest day will be day 12 in Las Vegas. I will have ran 352 miles by this point and I can't think of a better place to stop and "rest" for a day. Yeeehaaaawwwww!!!!! The first 12 days online! You may have noticed a few maps appearing on rungeordierun.com recently. I will be adding more over the coming months and each one will provide details of my route all of the way across the USA. I've recently started my 3rd attempt at planning the route across the USA and reconciling the mileage. It's a painstaking exercise but it will be well worth it when I get to the finish line in New York next year having run almost exactly the required number of miles. I say "almost exactly" as this was the approach I took for planning my route from John O'Groats to Lands End. My original route was 868 miles and I eventually went on to run 874 miles. That wasn't too bad but for the run across the USA, I'll need a slightly greater degree of accuracy. Remember, it's 3100 miles and I've only got 100 days in which to do it. It would be a disaster if I got to day 99 with 50 miles still to do before the finish! So far, the 12 days that I've plotted equate to 384 miles. This is exactly the same total and position on the I-15 that I plotted during the previous 2 attempts at mileage reconciliation. So far, so good! Unlike the previous 2 attempts, I'm now using Google Maps and the Street View feature. To be able to see an image of the surroundings at any point of the run is fascinating. I had a look at Kelbaker Road in the Mojave National Preserve tonight for instance. It looks hot and humid! 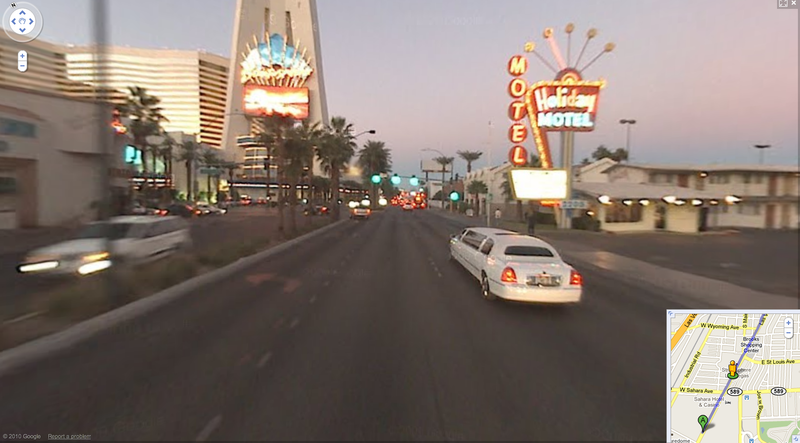 I was also able to have a good look at the route through Las Vegas (pictured). I'm now thinking of having my 1st rest day there! Please keep checking back for route updates. You can see all maps done so far by clicking here. Tuesday 4th May 2010 - 9.5 mile run. Treadmill. (01:34:47). Tuesday 4th May 2010 - 9.5 mile run. Treadmill. (01:33:07). Wednesday 5th May 2010 - 10 mile run, Rowlands Gill to Gosforth. (01:54:51). Wednesday 5th May 2010 - 9 mile run, Rowlands Gill to Gosforth. (02:03:19). Thursday 6th May 2010 - 19 mile run, Gosforth to Hamsterley Mill via Wylam. (03:48:07). Friday 7th May 2010 - 4.5 mile run, Gosforth to Newcastle. (01:04:22). Saturday 8th May 2010 - David Fairlamb's Beach Bootcamp. (00:45:00). Saturday 8th May 2010 - 19 mile run, Tynemouth to Newburn Bridge. (04:13:21). Sunday 9th May 2010 - 10.5 mile run, Peter's Pies 6 Tyne Bridges Challenge. (01:52:48). Sunday 9th May 2010 - 8.5 mile run, Shotley Bridge to Whittonstall and back. (01:39:31). Monday 10th May - 9.5 mile run, Treadmill. (01:47:10). Monday 10th May - 10 mile run, Treadmill. (01:51:11). Sunday 25th April 2010 - 10.5 mile run, Peter's Pies 6 Tyne Bridges Challenge. (01:42:35). Saturday 1st May - David Fairlamb's Beach Bootcamp. (00:45:00). As I write this, I'm 3 days into the plan to run 19 miles per day for 7 days. The week has been very successful with 57 miles done so far. Today's 19 mile run was very enjoyable and possibly the best running I've done all year. Yes, I've ran quicker and much further but it was the recovery that I've made following yesterday's runs that pleases me most. GPS details of the route can be found here. As a result of the time taken to run (and work and family time), I haven't had a great deal of time to update my blog. Rest assured that next week will see some major updates with more of the USA 2011 route revealed as well as some very exciting announcements and a review of this week's 133 miles of running. Also, there'll be another major delivery of Run Geordie Run t-shirts with a visit to the Post Office on The Great North Road in Gosforth scheduled. There is so much going on behind the scenes with help from a growing number of trusty folk. The hard work is beginning to pay off with the amount raised in the first 4 months of 2010 surpassing the amount raised in the whole of 2009. The current total, by the way, is £10,203.20 (15,197.10 USD). Thanks to everyone who has taken time to send a message of encouragement this week. It really does make a difference to my everyday level of determination which in turn shows in my running. If you'd like to give me your thoughts on how I'm doing or send a message of encouragement, I can be contacted at sponsorship@rungeordierun.com. For those of you on Twitter my ID is @rungeordierun and can be reached here. Whereeeeerrrreeereee has the t-shirt been this week! 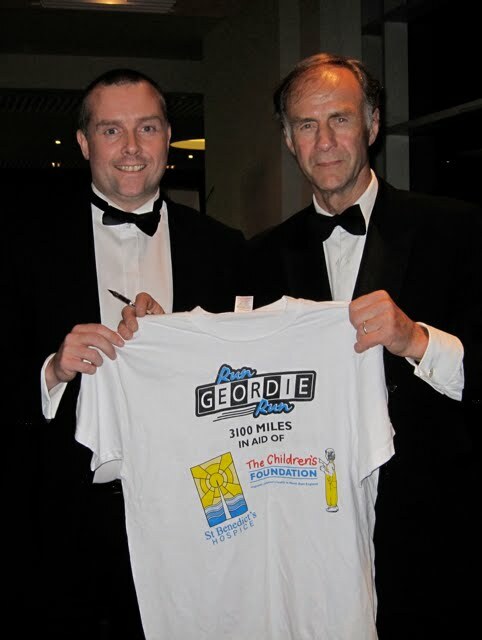 Sir Ranulph Fiennes posed for a photo with the Run Geordie Run t-shirt last week. This week, it was the the turn of another living legend; Mark Beaumont - The man who cycled around the world and more recently the man who cycled the Americas. Both of these quite amazing expeditions have been seen on the BBC and are nothing short of extraordinary. Mark started his 18,297 mile record breaking journey around the world on August 5th 2008. Incidentally, that date was the start of my final week on the 874 mile run from John O'Groats to Lands End. A journey which Mark cycled himself. At the age of 15! Mark smashed the record by a staggering 81 days, completing the journey in 194 days and 17 hours! Just think about those figures for a minute and you'll soon realise what an amazing achievement that was. I was lucky enough to see Mark's Tour on Tuesday at The Custom's House in South Shields. The theatre was packed, just like many other places on his tour as I understand it. After listening to him it's not difficult to see why. The first hour was all about the first journey around the world. Mark's delivery was very entertaining and articulate and gave a quite amazing insight into his incredible journey. I shook my head and raised my eyebrows many times throughout this first session in utter amazement. I don't want to give too much away for people who haven't read the book but what this guy has been through and how he has pushed the boundaries of human performance, endurance and mental strength is quite remarkable. I find it impossible to put a sentence together when writing this piece without using a ton of superlatives. I make no apologies for that. Mark deserves all of the superlatives that go his way. After following him for the last 8 months on Twitter I think "Inspirational" is quite a common one used by lots of folk. The second hour of the show went on to explain all about the journey down the Americas from a documentary maker's point of view. If you've seen the recent BBC documentary you'll know that Mark, for the most part, did all of the filming. Just like the first hour I found this section fascinating. Even more so, like so many thousands of other people, having followed this particular journey on Twitter. It all seemed so familiar and, just like the documentary, really helped bring the whole thing to life for me and I'm sure many others. Mark signed lots of copies of his book in the foyer afterwards and made time for many people (like me) to take a photograph and answer questions. Nothing seemed to be a bother as he dealt with a long and seemingly enthusiastic queue of good folk. I've corresponded with Mark on Twitter on a few occasions and he follows my numerous updates. For a guy of his stature to be aware of what I'm trying to achieve next year is something I simply can't find the words to describe. I have many virtual weapons in my armoury for USA 2011 and this is one of the major ones. Just like the documentaries this tour leaves you wanting to learn more about the world of Mark Beaumont. Without wanting to sound too patronising, youth is very much on his side and he could, in my opinion, go on to achieve so much more in the future. In doing that, the knack he seems to have developed in sharing his adventures will keep a growing captive audience very happy and inspired indeed. I started this piece talking about Sir Ranulph Fiennes. 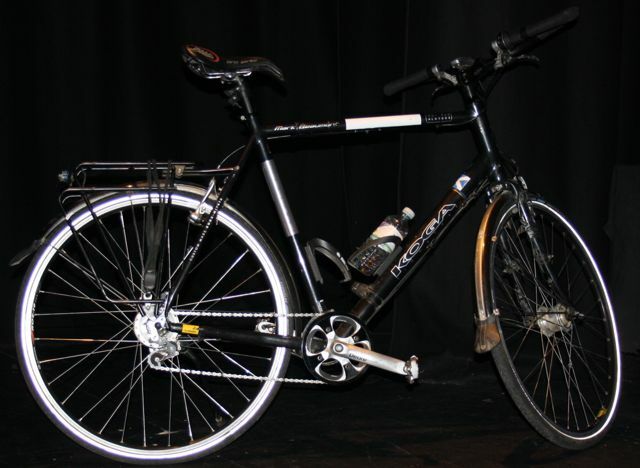 What price a Sir Mark Beaumont in the future? Whatever he chooses to do in the future it is clear that he has certainly achieved so much already. Who knows how many thousands of people he has inspired to date. Even the most casual of observers would have been inspired and amazed by the recent Americas documentary. Sadly, my words will never be able to do Mark's expeditions justice so I would strongly urge you to buy his book and read all about it yourself. It can be ordered here. Mark is also on Twitter here and online here. Oh and if I ever manage to top this latest "Wheeeerrrrrrreeeee has the t-shirt been this week" feature on this website, it will probably mean that Elvis has been found alive and well! This is one of the greatest "Whereeeeerrrreeereee has the t-shirt been this week!" features I'm ever likely to put on this website. Posing with the Run Geordie Run t-shirt this week is the worlds greatest living explorer Sir Ranulph Fiennes. Minutes before this photo was taken, I'd learned that the charity fund had burst though the £10,000 barrier. The fund currently stands at £10,073.20. Sir Ranulph was very impressed when I told him and wished me the best of luck with my own "expedition".